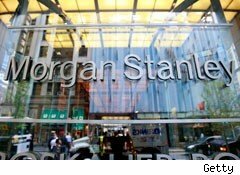 Morgan Stanley (MS) is expected to swing back to profitability in the second quarter when it releases results ahead of Wednesday's opening bell, but like Goldman Sachs (GS), Bank of America (BAC) and JPMorgan Chase (JPM), which reported before it, its revenues from trading likely swooned along with the market in spring and early summer. For the three months that ended June 30, analysts, on average, forecast Morgan Stanley to report earnings of 46 cents a share, according to data from Thomson Reuters. In the year-ago period, the investment bank had a loss of $1.10 a share. Revenue is expected to increase more than 46% to $7.93 billion from $5.41 billion a year ago, according to Thomson Reuters. The market will likely pay special attention to top-line results, given that bank revenue has been a concern this earnings season, as investors in Bank of America, Citigroup (C) and JPMorgan can attest. Thanks to lower losses on loans and credit cards, America's big money-center banks are managing to eke out profits and beat analysts' earnings expectations, despite a sharp falloff in trading income due to the stock market correction. As an investment bank, Morgan Stanley, like rival Goldman Sachs, is especially sensitive to ebbs and flows in the capital markets. Goldman Sachs said Tuesday that second-quarter revenue dropped more than 35% to $8.84 billion, short of analysts' average forecast of $8.94 billion. Revenue from trading and investments tumbled nearly 40% versus last year's second quarter, while investment banking revenue declined more than 35%. Robert Lee, an analyst with Keefe, Bruyette & Woods, told clients in a note ahead of the report that market volatility, especially in May, likely hurt client activity in Morgan Stanley's investment banking and trading businesses during the quarter. 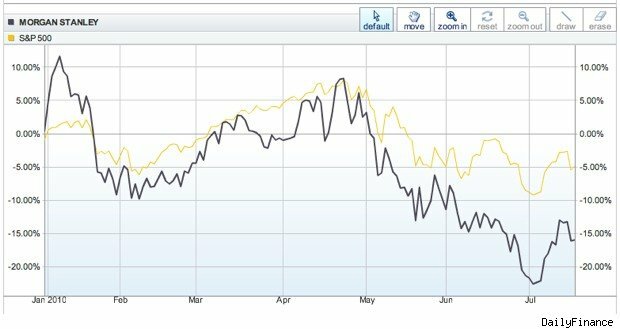 Shares in Morgan Stanley are off about 15% year to date, underperforming the broader market by 10 percentage points (see chart below).